Teletext launched 35 years ago and we were there almost right from the start! 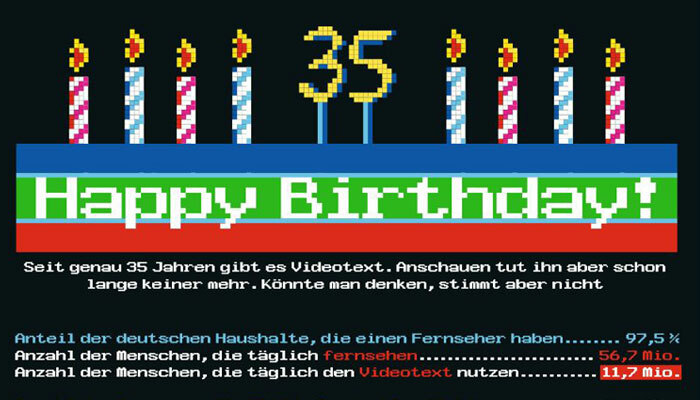 German weekly “Die Zeit” is marking the 35th anniversary of the Teletext information service with a special page in this week’s issue. Despite competition from the internet, Teletext still enjoys massive popularity, especially because of its ease of use. It is accessed by 11.7 million people in Germany each day. Last year during the Winter Olympics, Teletext even set a new record with 16.4 million visits in a single day. Almost every television set, including the latest Smart TVs, have the special software installed required to decode the Teletext signal. And about half of all the TVs in the world contain TARA Systems’ Teletext decoder solution. Bayerischer Rundfunk has also broadcast a TV report about the 35th anniversary of Teletext and TARA Systems: Managing Director Alexander Wass tells of the beginnings of Teletext and how the Megatext chip made it possible to receive the then-new Teletext Level 2.5. Siemens, the chip maker at the time, and TARA Systems developed the chip and the necessary software in 1993. In response to the arrival of high-definition TVs in homes around the world, TARA Systems developed its own TrueType font for Teletext to further improve the appearance of the service.